This paper proposes a simple noninvasive method that makes it possible to calculate the inner design parameters of the cemented doublet using measurements of its chosen paraxial optical and geometrical parameters without any damage to the system under testing (e.g., dismantling). Derived formulas are based on the knowledge of measured values of the lenses thicknesses, the radii of curvatures of the first and the last doublet’s surfaces, the paraxial focal length, and positions of the object and the image focal point. Practical usefulness of the proposed method is demonstrated on the real measurement of a known doublet. M. Herzberger, Modern Geometrical Optics (Interscience, 1958). 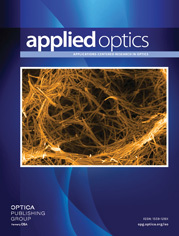 A. Mikš, Applied Optics (Czech Technical University, 2009). M. Berek, Grundlagen der Praktischen Optik (Walter de Gruyter & Co., 1970). M. Born and E. Wolf, Principles of Optics (Oxford University, 1964). W. T. Welford, Aberrations of the Symmetrical Optical Systems (Academic, 1974). A. Miks, J. Novak, and P. Novak, “Generalized refractive tunable-focus lens and its imaging characteristics,” Opt. Express 18, 9034–9047 (2010). D. Malacara, Optical Shop Testing (Wiley, 2007). G. V. Kreopalova, N. L. Lazareva, and D. T. Puriajev, Optical Measurements (Maschinostroenie, 1987). J. Picht, Meß- und Prüfmethoden der optischen Fertigung (Akademie-Verlag, 1953). J. Flügge, Einführung in die Messung der optischen Grundgrössen (Verlag Braun, 1954). B. Dorband, H. Miller, and H. Gross, Handbook of Optical Systems, Vol. 5 of Metrology of Optical Components and Systems (Wiley, 2012). A. Miks and J. Novak, “Experimental method of determination of parameters of cemented doublet,” Appl. Opt. 54, 7940–7943 (2015). L. E. Scales, Introduction to Non-linear Optimization (Springer, 1985). E. M. T. Hendrix and B. G. Toth, Introduction to Nonlinear and Global Optimization (Springer, 2010). Fig. 1. Optical scheme of cemented doublet.